« Any chips with that? It’s always nice to finish a few chores before the end of the year, and this little bit of landscaping has been drifting on for while now! In fact I think it really kicked off in earnest in February this year. But we came to realise we made a small mistake in our choice of fill. 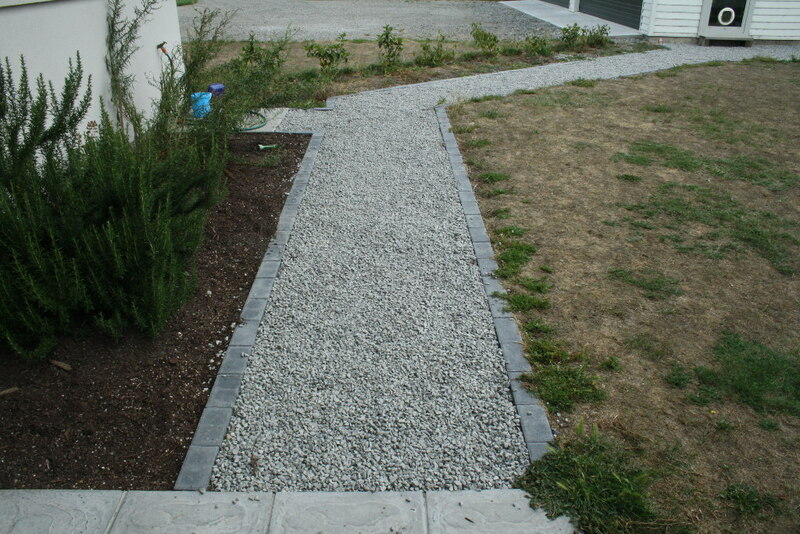 We originally filled the path with pea gravel. Which looked good. But actually wasn’t. It was way too small, so most of it made its way into the house in our shoes, or just drifted into the gardens. So eventually we dug all that out and the path sat bare of top coat for a while. Until today. Finally we went and got a couple of scoops of driveway chip and finished it off. Just in time for the new year! This entry was posted	on Sunday, December 31st, 2017 at 4:51 pm	and is filed under House, Plants and Gardens. You can follow any responses to this entry through the RSS 2.0 feed. You can skip to the end and leave a response. Pinging is currently not allowed. Powered by WordPress v 5.1.1. Page in 0.324 seconds.